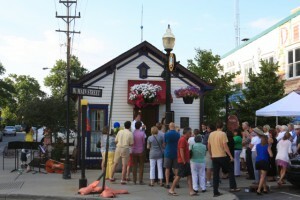 The Carmel Arts Council Children’s Art Gallery, featuring the “World’s Smallest Children’s Art Gallery” was formally opened by Mayor James Brainard in January of 1998. It was the first gallery in Carmel’s Arts and Design District. At that time, the Carmel Arts Council featured student art, throughout the academic school year, from just the elementary schools in Carmel and Our Lady of Mount Carmel. Today the Carmel Arts Council features student art from all grade levels of the Carmel-Clay School System and Our Lady of Mount Carmel. The Carmel Arts Council also displays student art from community non-profit organizations. Following each academic year, the Carmel Arts Council exhibits high school art with two separate exhibits. The first exhibit showcases the artistic talent of the Carmel Arts Council’s 1st and 2nd place Visual Art Scholarship winners. The portfolios of these exceptional artists, who plan to continue their art education in college, are exhibited in our gallery. During the summer months of July and August the Carmel Arts Council holds their summer art show. This show represents the work of qualified high school student curators who have planned and constructed their own high school art show through the Carmel Arts Council’s Emerging Curator Program. The building was originally a wing from the 1875 Zina Warren home. In 1975 it was moved to 30 West Main Street for the nation’s Bicentennial. The gallery was moved to its current location, 40 West Main Street, in 2005.